We're honored to feature "Tales of a City II" by Seigar in Issue Two of Orson's Review. Issue Two of Orson's Review will be released on March 19th, 2019. We're also very fortunate for the time Seigar took to sit down and chat with us about his journey as a photographer. *The following interview involves Orson's Publishing (OP) and Seigar (SG). OP: How did your journey with photography begin? SG: As soon as I got my first salary as a teacher, I started traveling, and this provoked the connection to photography to spark. I felt the need to record all my trips with a camera. Once home, I'd show the photos to my friends and family, and they seemed to be impressed with them. However, they also missed the typical postcards and the stereotypical images of the places I was visiting. My photos weren’t what they were expecting. At the same time, there were common details and objects in all my images, no matter the city I was in; there would be recurrent elements. Traveling is my passion and it is my main source of my productions. Nevertheless, I’m interested in showing my own visions of the places, using my personal filter. Little by little, I realized the subjects were once and once again there in my photos and the vision was mine. These repetitions became my pop fetishism. My style was being formed almost unconsciously, just being intuitive and loyal to myself. OP: Is photography your occupation? SG: Photography is my main passion right now, though I also work as a teacher at a Secondary School in Tenerife. I love teaching and methodology. I think both jobs are connected to communication, which is a topic I have always been interested in. Teaching and photography are two ways to express myself and also to interact with others. I suppose there are some analogies in the manner I understand both professions: innovation, creativity, research and the human side. OP: What about these photos are you most proud? SG: "Tales of a City II" is the second part of a wider and ongoing photo-narrative project about London and UK. They include all my fetishes in photography: street portraits, My Plastic People, shop windows, food, messages and abandoned objects. These elements are presented with a pop perspective and linked by aesthetic decisions such as saturated colors or the use of reflections. This series represents me as a street photographer. London is the place I feel most inspired. OP: Tell us about your process. Do you approach all photographs in the same way? SG: I’d describe my work as travel, urban, social and street photography. My images are full of reflections, saturated colors, shadows, food, abandoned objects, street portraits, repetitions and pop references. These are the typical elements that drive me to take an image. I’ve become a fetishist of the plastic people I find in shop windows, they have become my main subject, and they help me to portray anthropological and sociological issues. Through these portraits I reflect people’s lives, their beliefs, their costumes, body awareness and other traits. On the other hand, reflections permit me to create richer and complex layers without the need to use retouch programs. I’d consider my work free, out of the rules and conventions I’ve learned and that I’m still learning about photography. I’m not afraid of pushing boundaries or breaking rules. I’m more interested in enjoying and producing effects, in the transmission of feelings and emotions. I want people to feel my images. OP: As a child, what did you want to be when you grew up? How has that impacted your photography? SG: I grew up in La Palma, also called “La Isla Bonita” like the song of Madonna, in the Canary Islands, Spain. I studied my equivalents of GSCE and A- Levels there. I have had a creative mind since I was a child, attracted to music, cinema and art. I remember buying myself magazines instead of kid stuff. I still love reading and collecting mags. At home, I would look through all the encyclopedias always looking at the art entries to see the images. I am a visual person. I was always a lover of music, music videos and lists. All those audio visual worlds formed me. I would never miss the countdowns on the radio every Saturday morning or the video ones on TV shows. I would spend time writing music lists, stories, drawing female fashion designs in my notebooks at school and things like that. I also loved learning languages and communication. All these bonds created what Seigar is today. I was into the big icons from the 1980s during the 1990s. I refer to Madonna, Michael Jackson and Prince, all their iconography has influenced my personality. Their music, videos, films, concerts, their always transforming image and thoughts are the main and clearest art influences in my life as an adolescent. Years later, I watched all the cinema classics I could (Aldrich!). So films like Sunset Blvd., All about Eve, What Ever Happened to Baby Jane?, Hush…Hush, Sweet Charlotte or Suddenly, Last Summer became my top picks. I enjoy the works of Lars Von Trier, Tim Burton, Tarantino and Michel Gondry. However, Alfred Hitchcock and Pedro Almódovar ended up being my all-time favorite directors. They define my concept of passion, love, romance and life, from the light to the dark feelings. They have portrayed human nature the way I also feel it. As a curious and imaginative person, I finally focused myself in photography as a result of my love towards traveling. Traveling is my inspiration and it has opened the doors for me to photography. The thing I like most about life is traveling; visual stimulus brings happiness to my life. Then, add to this my inner willingness to be a contemporary recorder or a visual journalist. I always try to testify every single event I experience my way. All this curiosity made me the street and social photographer I am today. OP: Tell us about the biggest sacrifice you’ve made while pursuing photography. SG: I started my journey in photography in 2009. Since then, I have trained myself in this art. However, for the last two years, I have also been doing an advanced course in photography in Los Realejos, Tenerife. Next year, I have the intention to do a cinema and television course. As a visual person and artist, I want to find new ways to express myself. I wouldn’t consider studying as a sacrifice though. The time I dedicate to photography is possibly my main sacrifice. I respect the natural rhythm things move in within this art. OP: Tell us about the best shoot you've ever been on. What made it so good? SG: Visiting a city for the first time is completely inspiring for me. I open my eyes and look around exploring every single corner looking for the image that tells me something. Traveling is as I said the main source of inspiration for my outcome. I’m a very active and passionate person, always on the move. Living life in this intense way helps me to be a prolific and never paused photographer. Social events and excursions help my production to scale. It inspires me a lot to enjoy a music festival, the opening of an exhibition at a museum or a café; I enjoy recording social life with my camera. I suppose a shop window photograph would be the short answer to this question. OP: What do you cross your fingers for as a photographer? SG: I want viewers to feel my images. I want them to come to conclusions about why I am showing that. I would like people to guess which intentions I had. I want people to feel moved by my plastic people and to enjoy my street photography. I like transmitting emotions, feelings, sensations, everything connected with the inner world. I want the world to be able to identify my style. OP: Where do you see your journey with photography going? SG: I would like to get commissions to visit cities, towns or countries and show them my way. I wish for my social-documentary photography to get more impact. I want to exhibit my Tales in the UK. I’m ambitious, so I have lots of dreams to fulfill. Meanwhile, I will keep on working. My next step is to make a photobook compiling my Tales of a city. I have come up with three series from this project. So I think now it is a good moment to pause and show it to people in a book format. I also want to consider other places to explore and to document. I want to try new formats in my future exhibitions. I’m interested in conceptual contemporary art in all its forms, I want to experiment mixing them and find new ways to express myself. 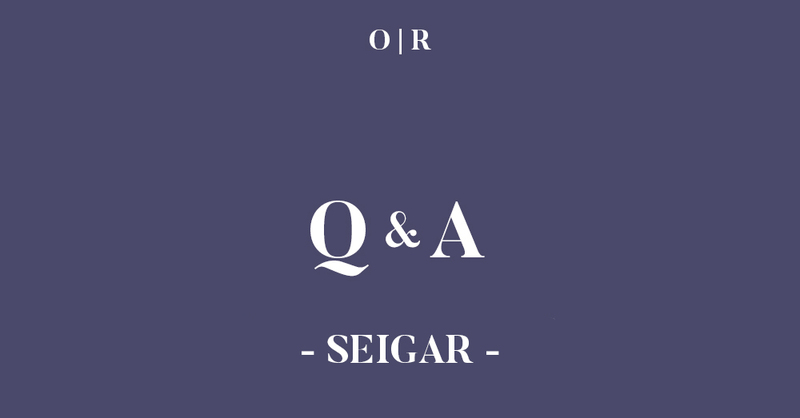 Seigar is an English philologist, a highschool teacher, and a curious photographer. He is a fetishist for reflections, saturated colors, details and religious icons. He feels passion for pop culture that shows in his series. He considers himself a travel and an urban street photographer. His aim as an artist is to tell tales with his camera, to capture moments but trying to give them a new frame and perspective. Traveling is his inspiration. However, he tries to show more than mere postcards from his visits, creating a continuous conceptual line story from his trips. The details and subject matters come to his camera once and once again, almost becoming an obsession. His three most ambitious projects so far are his “Plastic People,” a study on anthropology and sociology that focuses on the humanization of the mannequins he finds in the shop windows all over the world, “Response to Ceal Floyer for the Summer Exhibition,” a conceptual work that understands art as a form of communication, and his “Tales of a City,” an ongoing photo-narrative project taken in London. He usually covers public events with his camera showing his interest for social documentary photography. He has participated in several exhibitions, and his works have also been featured in international publications. He writes for The Cultural Magazine (Spain) about photography and for Memoir Mixtapes about music (L.A.). Be sure to check out “Tales of a City II” by Seigar, featured in Issue Two of Orson’s Review.